The Second Century Endowment Foundation was established in 1986, upon the celebration of the first century of operation of Newton Public Library. The mission of the Second Century Endowment Foundation is to enhance the adult collection of the Newton Public Library by increasing and promoting educational, literary and artistic resources available to our community. In 2011, the Foundation became an affiliate of the Central Kansas Community Foundation, Inc. with the new name: Second Century Library Foundation – Newton. The funds will provide for an annual income for enhancements beyond those possible through general operating funds. 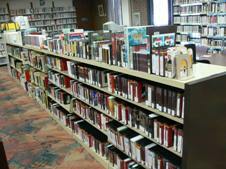 More than just books are needed at Newton Public Library to be a part of today’s information society. Audio/visual materials, art works, computer programs and on-line access have joined the books and magazines to provide information and recreation to individuals. A gift to future generations through the Second Century Library Foundation – Newton will make you a part of the legacy which will keep Newton Public Library an important informational and recreational access location for the community. Make it happen! Add to the CD/DVD/e-book collections. Continue a quality music collection. Add to the reference and business collection to better serve the community. Enhance the genealogy collection to help family researchers. Upgrading of all resources available in the library. Keep pace with technological information. The Second Century Board will host the 2019 Newton Flower & Garden Tour to benefit Newton Public Library. This 23rd Tour and fund raiser will be held Saturday, June 8, 9 AM – 12 PM and Sunday, June 9, 1 – 4 PM. $8 donation tickets will be available at Newton Public Library, 720 N Oak, or at the Tour gardens during the tour. See highlights from the 2017 Flower and Garden Tour. See highlights from the 2012 Flower and Garden Tour. See highlights from the 2010 Flower and Garden Tour. See highlights from the 2009 Flower and Garden Tour. Call 316-283-2890 for more information. 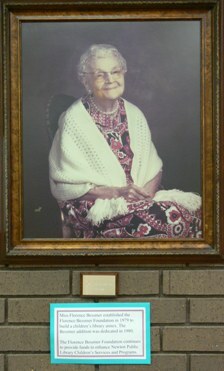 Miss Florence Bessmer established The Florence Bessmer Foundation in 1979. The Foundation provides for the housing and equipment for modern, educational and entertainment programs and uses for children, including furniture, shelving, books, materials, audiovisual and learning aids, as well as for facility enhancements. She established the fund because for most of her 100+ years she was actively and ardently interested in the welfare of children. The Florence Bessmer wing was completed in 1980 and serves as a meeting room for library and public functions. Income from the Florence Bessmer Foundation currently provides for special programs, print and nonprint resources for children, and more.